I can't tell you how many times I've seen players - both pros and amateurs - check their alignment by setting a club along the line that connects their toes. In my view, that's a mistake. The reason is that most players tend to flare open one or both of their feet. 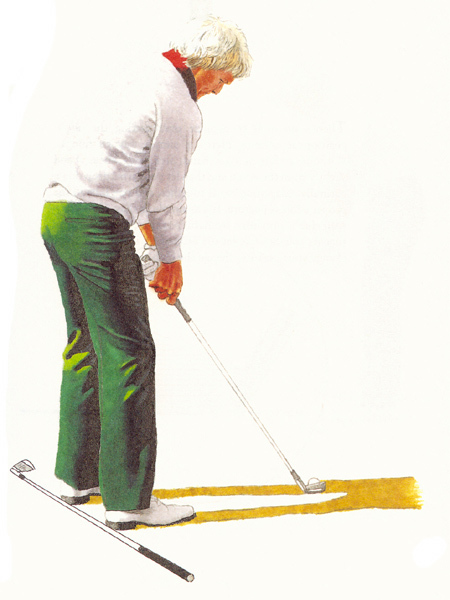 Most common is the flared left foot, which brings the left toe back four or five centimeters from the target line. The result is that, if you lay a club down from toe to toe, that line will point well left of target, and will not reflect your actual alignment. Your hips, knees, and shoulders may be perfectly square, but the flared toe line will make you look open. A more precise way to check alignment is to lay the club along your heel line. As your toes flare, your heels remain on line, so the line that connects your heels will accurately reflect the actual alignment of your feet.